Despite 25 years of legal battle in various national and international courts, the indigenous and peasant communities of the UDAPT – Union of those Affected by the oil operations of Texaco (now Chevron) in the Ecuadorian Amazon, still have not obtained justice and reparation for one of the most important environmental disasters on the planet. Denouncing Chevron’s impunity is not an Ecuadorian or Latin American issue. It is an emblematic international struggle for Peoples rights and the real enforcement of national laws and international treaties that protect human rights. UDAPT is part of the “Global Campaign to reclaim peoples’ sovereignty, dismantle corporate power and stop impunity”. In addition, it has joined the European “Campaign Rights for Peoples – Rules for corporations”. 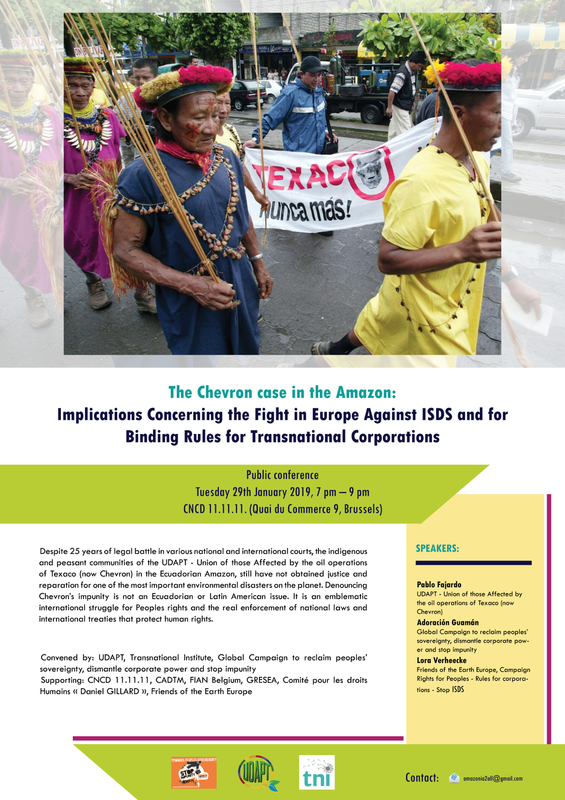 This Campaign aims to put an end the ‘Investor-State-Dispute-Settlement’ (ISDS) system, used by transnational corporations to threaten governments that dare to stand up to them, with claims of up to billions of euros. It also supports the establishment of binding rules for corporations to respect human rights. What lessons can be learned from this experience in Europe in the struggle against transnational corporation’s violations and their threats on Peoples sovereignty? What strategies can we develop collectively?